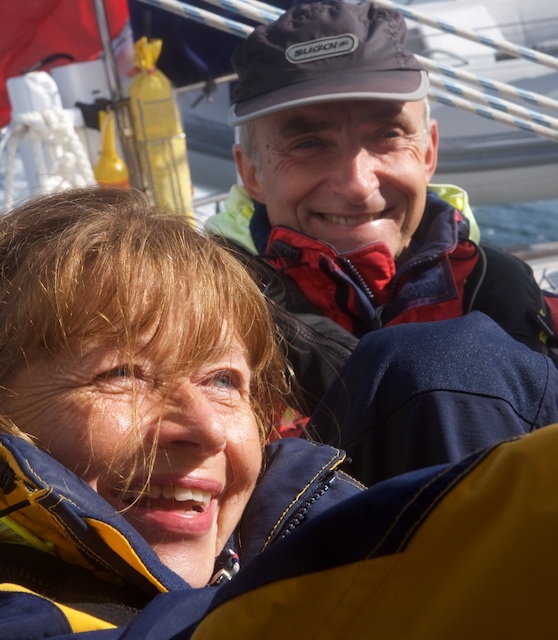 For Achim it was already his third week on Regina Laska in 2017, but as the first two ones were a Yachtmaster prep course it was the first real holiday sailing week also for him. For me, it was the first time on Regina Laska. 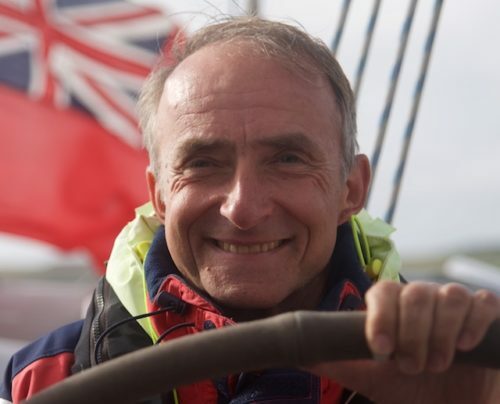 My husband Achim while sailing in Scotland on Regina Laska with me. Thinking back of our previous time in Scotland many years ago, we were looking forward to a great week in sunny Scotland. Well, the weather was not like that this time, unfortunately. Even for a Scottish summer it was pretty cold and rainy. Usually, lows are moving fast but this one was extremely slow and stayed with us most of the time. Obviously, it liked us. However, weather is completely overrated. What matters instead, are the people and the boat and guess what…?! It was a fantastic week onboard Regina Laska!!! 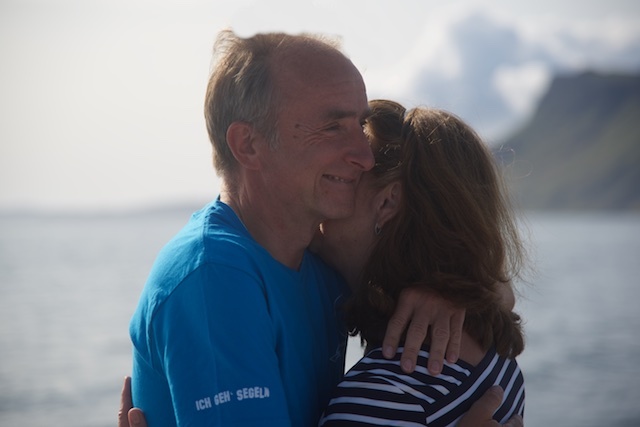 It started with meeting our fellow crew Irene and Per, a Norwegian couple. 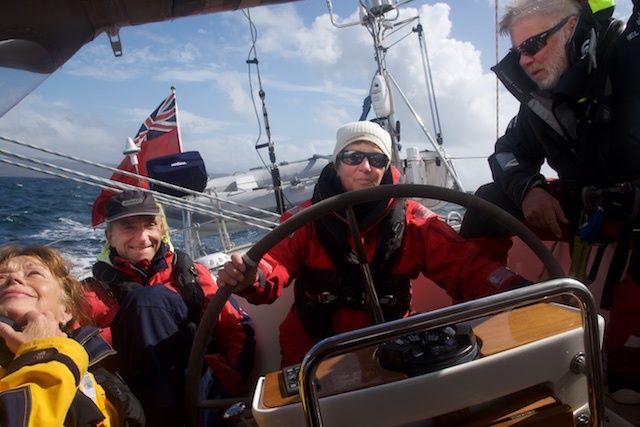 They were funny with a great sense of humour, very laid back and with a lot of previous sailing experience to say the least! It was a perfect match for our week’s sailing in safety, comfort and style. 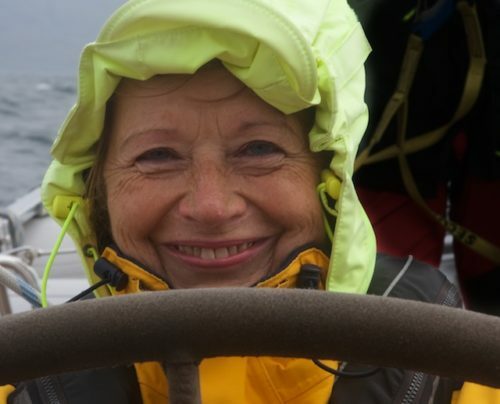 I know that “safety, comfort and style” is what Leon says about sailing on Regina Laska and I was really eager to experience what this could mean in practice. Achim and myself in Tobermory, our first port of call. And so we did: Leon creates a warm (heating ran 24/7) and cosy atmosphere so that it is easy to feel at home onboard Regina Laska. He provides a perfect mix of hospitality and caring for his guests. 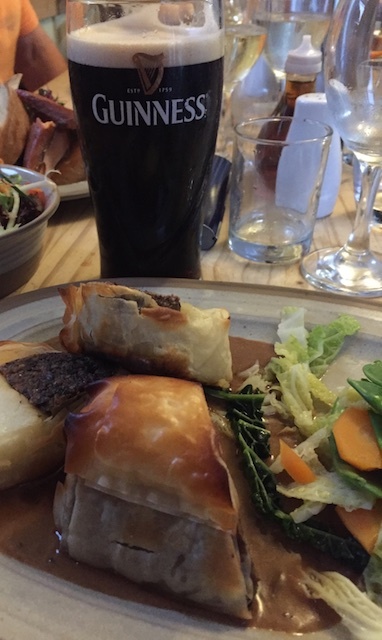 Cooking delicious meals and knowing very good restaurants and pubs is an important part of it. 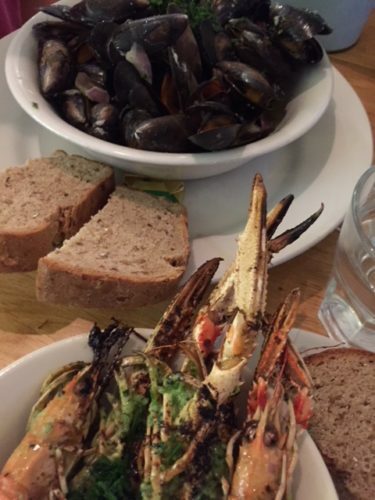 Great seafood at Café Fish in Tobermory! 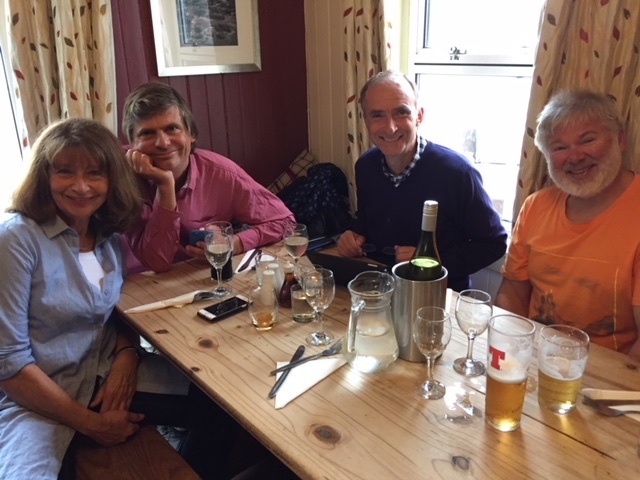 Good meals and drinks inspire the conversation and therefore we had very entertaining evenings in four languages: Norwegian, Swedish, German and English. 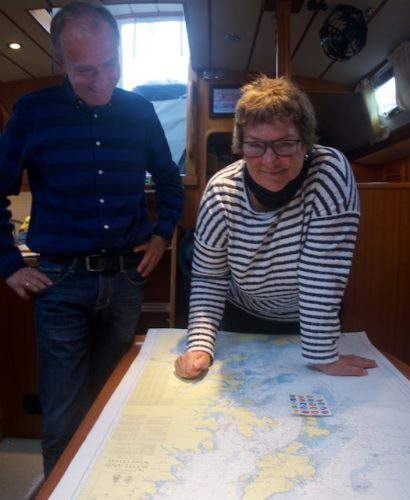 The highlight was a film about Per and Irene’s trip to the Lofoten and Spitzbergen with their own Hallberg-Rassy. Enjoying our company in Regina Laska’s cozy salon! 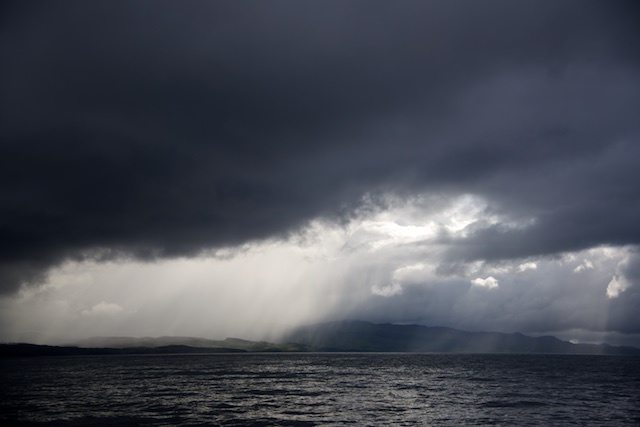 The heavier weather in Scotland provided for a lot of interesting sailing experience. 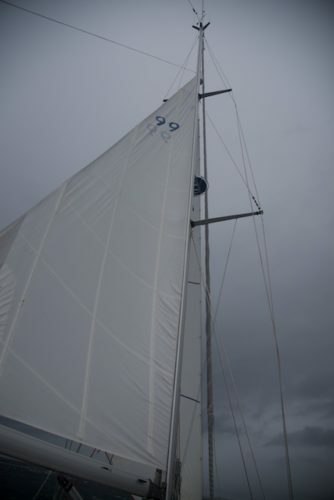 We tested Regina Laska’s cutterstay sail, we enjoyed the strong winds and the high waves. Three reefs in the main and the cutter stay sail. 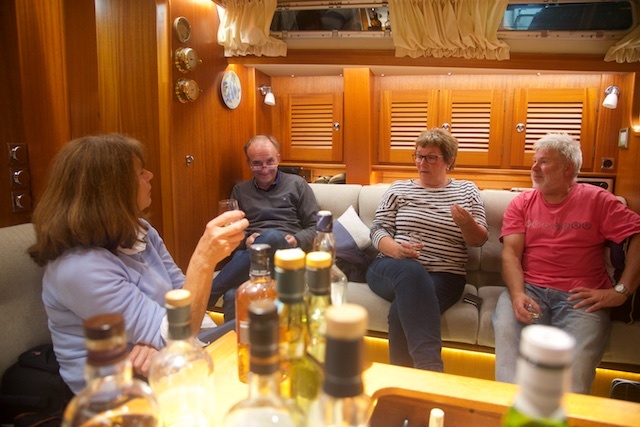 We also talked about almost every piece of equipment you can have on a sailing boat. 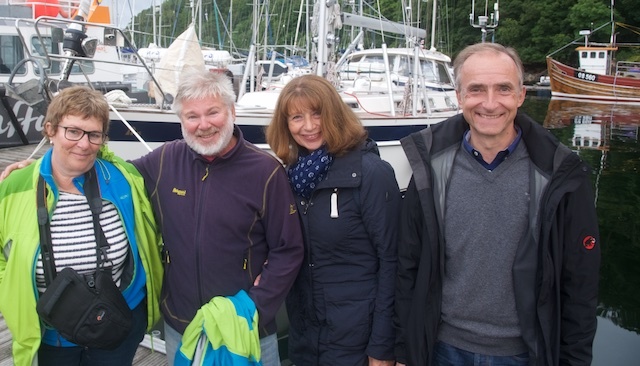 Per and Irene had just finished their own refit of their newly bought Hallberg-Rassy 42F. Combined with Leon’s enormous knowledge gave food for very interesting discussions for our own refit plans of our Hallberg-Rassy 43 we keep in Warnemünde, Germany. Achim and Irene planning our Scotland cruise. 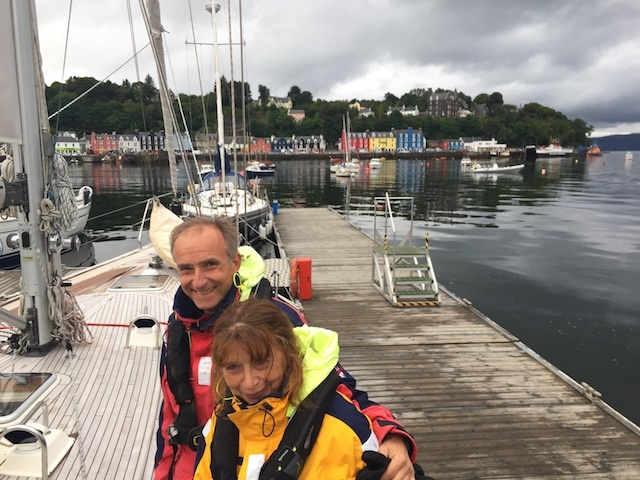 As part of our tidal experience we anchored in Loch Moidart which was just about deep enough for us to go in there at the time in question (enough tidal water above the threshold). We used all devices available and in particular the detailed ANTARES charts Leon had on his mobile phone encouraged us to go in. Sailing over the charted depth of 0.4m into the castle in Loch Moidart. We did it without hitting the ground thanks to correct tidal calculations! 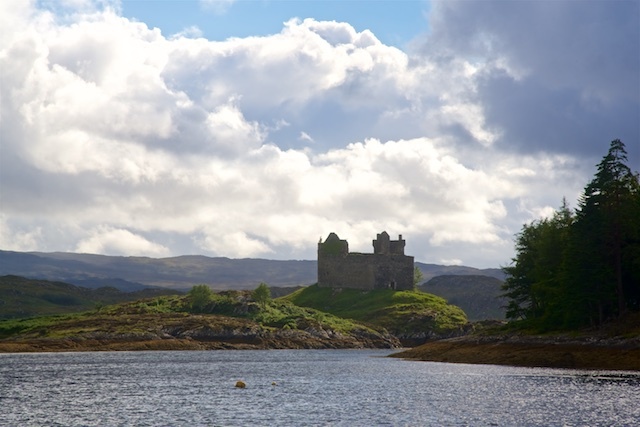 Anchored next the the castle in Loch Moidart. This was the evening for the steam sauna! First Irene and Per and then we followed. Per was brave enough to dive into the cold water of the Scottish Loch Moidart. 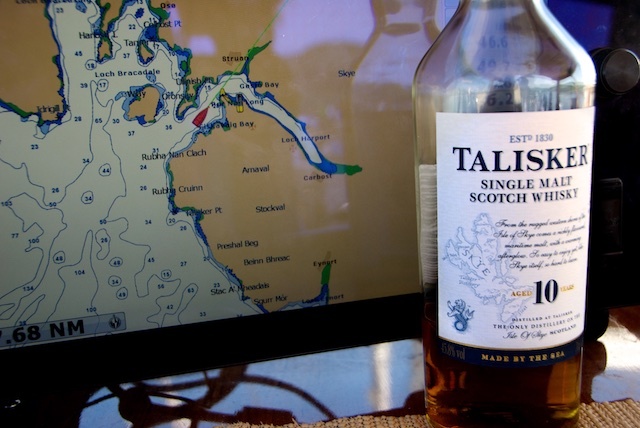 Finding our way to Talisker on the island of Skye. Scotland and Whisky makes a pair and so we sailed to the Isle of Skye and to the remote place of the Talisker distillery. We enjoyed the extraordinary landscape, the amazing greens with white dots on them (which turned out to be sheep). 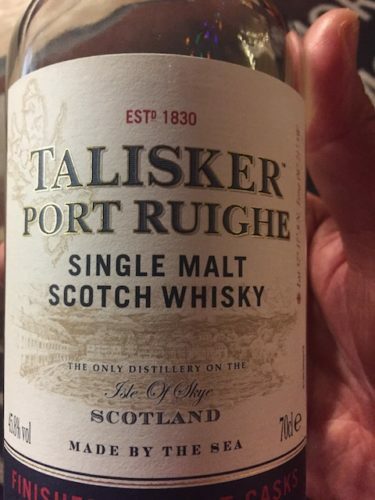 Talisker is a small village mainly consisting of the distillery and a pub serving the same. No harbour, just a pontoon. It is in the middle of nowhere but to our great surprise the pub was overcrowded with happy people and we were lucky to get a table. Tasty food and good drinks were served, later live music was performed. This was the evening for traditional Scottish food. 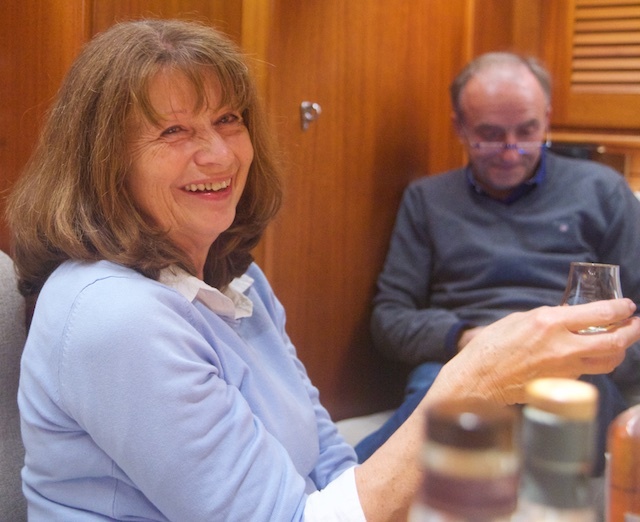 Leon and Irene were up to Haggis and most of us tasted a special edition of Talisker whiskey. However, we did not need to visit a distillery itself because Leon had so many different sorts of whisky onboard already, which I enjoyed a lot. 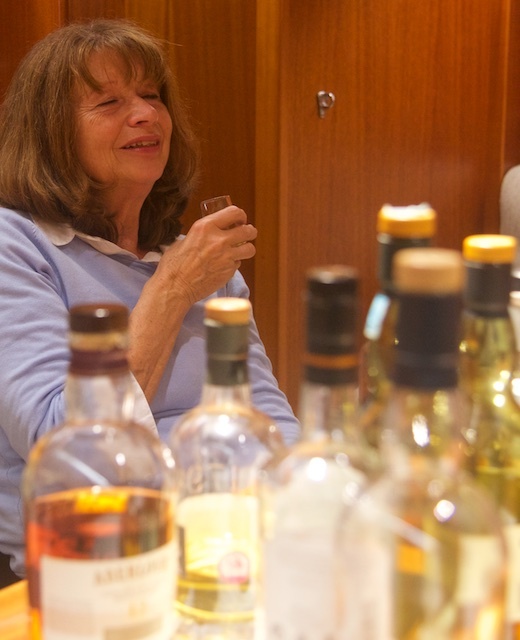 Leon organising a whisky tasting onboard. 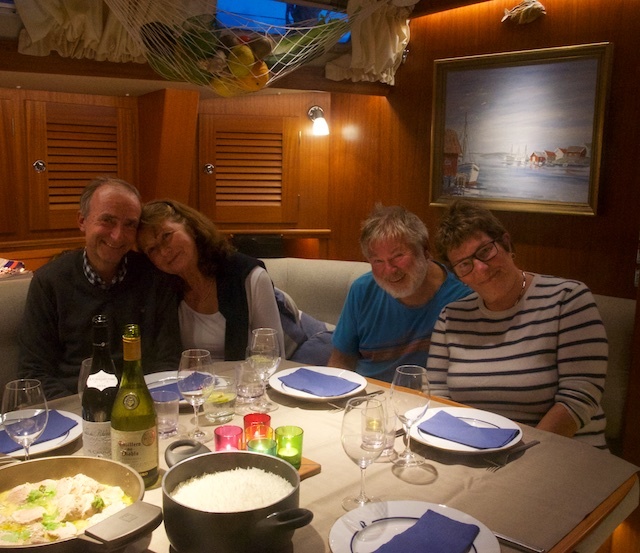 A lot of food for discussion – One does not only talk about boats, cruising grounds and equipment when sailing on Regina Laska! I really enjoy whisky to start with. 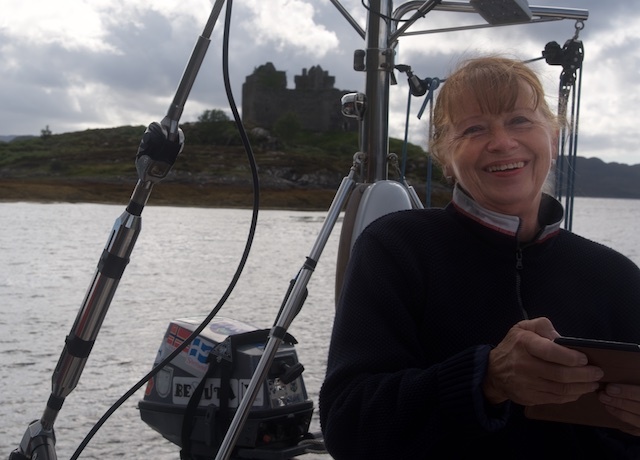 Bot on a boat at anchor in the Scottish Hebrides is the true spot to enjoy it, for sure! 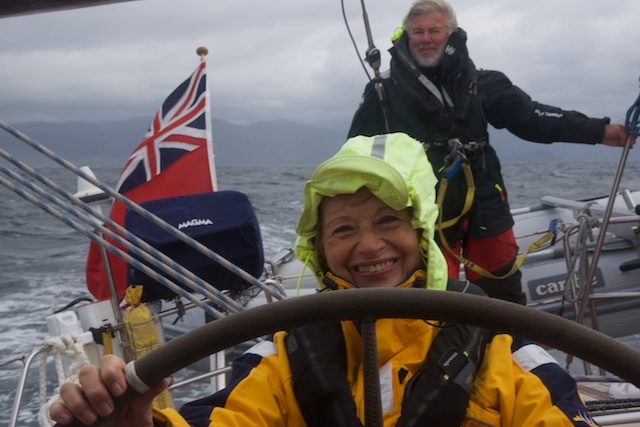 From Skye we continued south, sailing in stormy weather and made it to Tinker’s Hole just south of Iona. 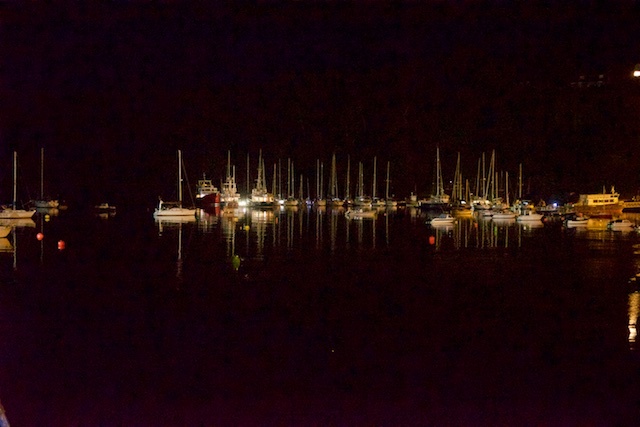 This was yet another beautiful place where we anchored; just Regina Laska and us. The next and final day the weather was calm and we could visited the island of Iona. Iona is one of many, many Scottish islands dominated by an Abbey and a Nunnery and is known as the „Cradle of Christianity“ in Scotland. 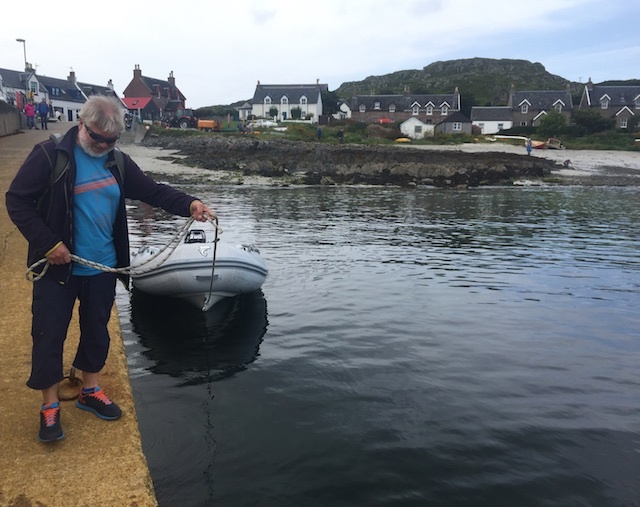 On Iona: Per figuring out where to tie up the dinghy so it is neither dangling in the painter or the onshore knot of the painter is under water when we come back and the tide has gone out or come in. 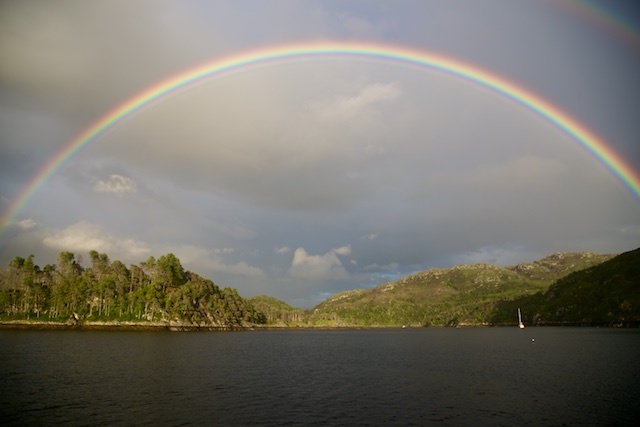 Overall, we had a wonderful week with great people, beautiful nature, impressive culture, challenging weather, perfect sailing with Regina Laska and Leon as the boat’s heart and soul. 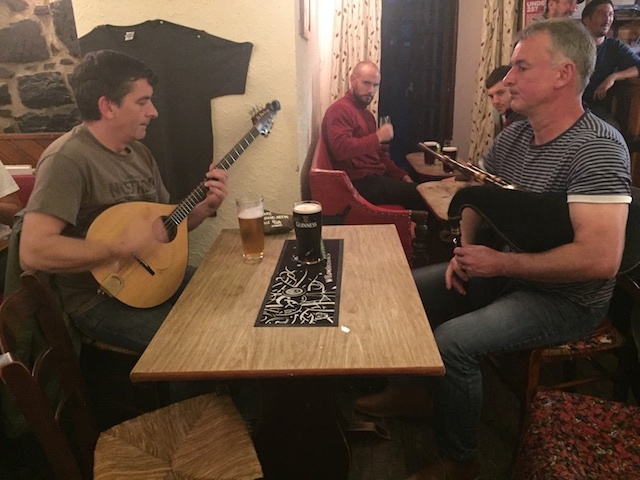 We have enjoyed the week thoroughly and we liked it so much that we immediately decided to come back in 2018 – next time even crossing the North Sea from Shetland to Norway…! 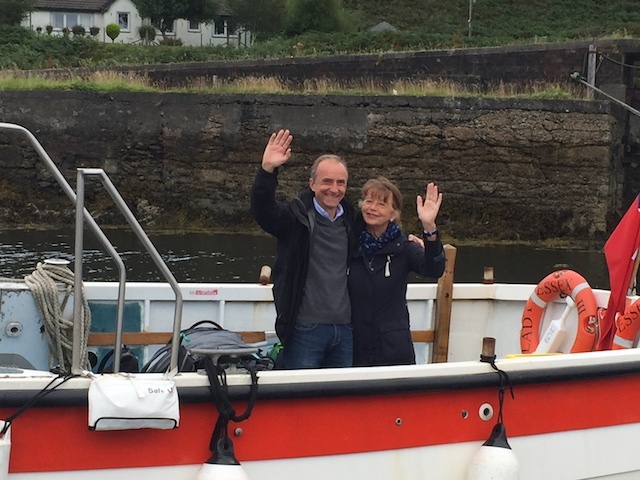 Our last waving good-bye from the ferry taking us from Oban Marina on the island of Kerrera back to the mainland and home to Germany. Thank you, Leon, and looking forward to the next leg in 2018!